Got Craft? celebrates its 24th event and 11th year as Vancouver’s largest indie craft fair at The Maritime Labour Centre in East Vancouver December 8-9, 2018. Shop from over 85 handmade makers and local brands, including almost 20% new vendors to the show. Vendors will showcase clothing, beauty and bath products, jewelry, artisanal food, art, ceramics, home goods, greeting cards, and so much more. The market gives an opportunity for shoppers to buy locally and handmade for each person on their gift list. Guests will enjoy food from Chickpea and Disco Cheetah, swag bags, a play area hosted by Aster + Clove, and book signings by local authors, Lyndsay from Coco Cake Land and Megan from Pip + Pin. The first 50 people at the event each day will get amazing swag bags filled with goods from vendors. Each limited edition tote is printed by local maker, Robbie Vergara Screenprinting, and are designed locally by The Beautiful Project. With vendors coming from all over BC, Got Craft? 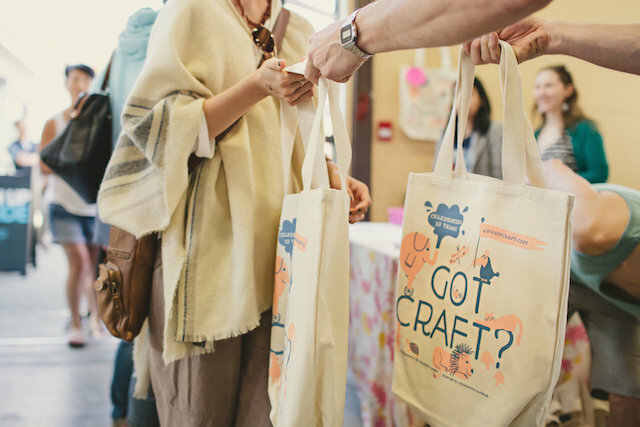 showcases the best in independent craft and design, connecting makers with savvy shoppers. Experience a lovely day out with your friends or partner while shopping for unique, locally handmade goods for your gift list. Got Craft? has once again offered up an amazing prize pack for a lucky Miss604 reader to win. This year’s haul is valued at over $1,100 thanks to Got Craft? vendors! Follow the event on Facebook, Twitter, and Instagram for more information and inspiration. I will draw one winner at random from all entries at 12:00pm on Wednesday, November 28, 2018. 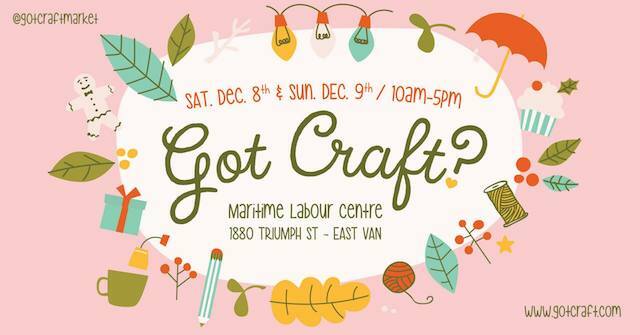 Winner must pick up their prize pack at Got Craft on December 8 or 9, 2018 between 10:00am and 5:00pm at the Maritime Labour Centre in Vancouver. Update: The winner is Kelly Cote Erickson! This is my absolute favourite craft fair, I make sure to go to the spring and holiday edition every year and every year the vendors get even better. Such a great way to support local businesses! I bought so many cool gifts there last year. Shop local! This is one of my favourite craft shows in the year. Love this show! Great vendors! Awesome prize pack! Lots of great items that would make perfect Christmas gifts! Done all 3 to enter! 🤞 Such a great prize pack! Entered and liked on facebook for this wonderful contest. Wow! That’s an amazing prize pack. Count me in. This prize would be amazing! Thanks for the chance! This looks like a great event. I am sure to check it out. Amazing! Love this gift fair. Such great stuff! Love this craft fair…so many unique items! WOW this prize sounds incredible. Thanks for the chance! Love supporting local. My most favorite craft event of the year! Got Craft vendors are always fantastic. This is one of my favourite Christmas Craft sales. I’m looking forward to going! I’ve heard so much about this fantastic holiday market. Awesome! So many wonderful gifts! Would definitely share the wealth if I won. My sisters and I make a point to go here each winter as a fun Christmas shopping trip. We find amazing unique local/artisinal items that make incredible gifts. Now we take our teen daughters as part of the fun! Just discovered this craft fair last year and it’s amazing! 😍 my fav craft Fair! Got Craft! is a holiday tradition for my daughter and I. GOT CRAFT! GOT TO GO THERE! NEVER BEEN, BUT LOOKS AMAZING! THANK YOU FOR THE GREAT CONTEST! MERRY CHRISTMAS EVERYONE! The crafty people know how to enjoy Christmas, so fun to see all the creativity they display. This looks like a great market – would love to check it out. I love craft fairs! Got Craft is a good one. So many fun things to see and buy! A feast for the senses! Got craft is the best! Thanks for the contest. Wow great prize right in time for the holidays! How have I never heard of this ?! It sounds so neat I would LOVE to check it out ! I would love to attend this craft market. Lots of interesting vendors. This prize sounds amazing! Thank you for the chance! This would be a great gift to keep giving. This would be a amazing prize pack. I plan to attend! It’s my favourite craft fair of the year! I’ve actually never been to a craft fair before and would love to go! This looks like so much fun! So many amazing vendors! This show is always solid. So many lovely things to buy at this Craft market. So many talented artists! We’re so lucky! I love picking up unique gifts at the market! This would make my christmas!!! Would love to win this amazing prize pack! Would love to check out and support these amazing vendors! Another great prize! This would be amazing to win. Wow, what an incredible prize pack! Would LOVE to win this! Would be a great birthday gift! Great prize package from a great holiday market! I’m sure this prize would have so many amazing Christmas gift ideas (and some for me, too!). Hoping to check in this out! The craft fair sounds fabulous. The vendors sound like they would have interesting things. The craft market has so many vendors with fabulous products. Thanks for the contest! The craft fair looks great. Thanks for putting this on your blog. Would be a great fair ! Fabulous market! Would love to go. Sounds like a great market – would love to check it out! WOW….wonderful vendors and prizes. Another great contests. Seasons greetings to all. What a wonderful chance to buy local! Thanks Miss604 for this awesome contest! I would love to go to this market! Never heard of this. Thanks @Miss604 for another great find! Sounds like a great craft fair. This is my favourite craft market! Can’t wait to go, but winning tickets would be sweet!! Thanks!! This is a great craft fair. It really would be the most wonderful time of the year if I won! I can’t wait for Got Craft! This is my favourite event to shop for holiday gifts! Yes please. I would love to support local artists. Got Craft sounds amazing! I would love to win this incredible prize! Gotta support these local creators! Buy local! Amazing, looking forward to it this year! Will be there anyway but this prize is unreal! Got Craft? Got AWESOME Prizes!! Such a fantastic craft fair featuring local artisans. Got-a-Go! It’s craft fair season! I love hand made goods. One of the best indie craft shows in Vancouver! The prize pack sounds unbelievably amazing! Got Craft? is always such fun. Would love to win. Thank you for the chance. love these events in East Van! I love finding out about local companies at Got Craft! This is an amazing prize pack! Got my tickets weeks ago. So excited! This is our favourite crafter’s markets! My sisters and I go every year and our teen daughters love it, too! Cannot wait! Such a great event. Shop local! So excited for Got Craft? this year! Can’t wait to check out Got Craft this year! An amazing way to support amazing small businesses! Thank you for this generous contest and the opportunity to enter. Amazing! I need to check it out!